Join Sonoma Coast Divers for a one-day class on the skills required to safely and successfully shoot a speargun under water. This is a one day beginner program that is conducted on the Sonoma Coast, north of the town of Jenner. The class consists of a beachside lecture that will talk about the equipment required for spearfishing, Fish and Game regulations concerning spearfishing and how to identify the most desirable fish, free diving techniques used to spearfish, and proper techniques to load, dive, and shoot with a speargun underwater. Spearguns are provided for each buddy team, and teams will have the opportunity after the class to hunt on their own. The dives will be in depths of 12 to 20 ft. of water, with visibility usually in the 5-15 ft. range. Entries and exits to the water can range from a sandy beach to a rocky tide pool environment. The dive sites will vary and will depend on the conditions on that day. We will meet at a predetermined site on the coast and travel to the selected site from there. Transportation is not provided. After the class we will have a potluck picnic (please bring something to share if you wish to stay for the picnic) and if conditions have been favorable, we will cover the cleaning, and preparing of your catch. All divers are required to have a mask, fins, snorkel, boots, gloves, wetsuit w/hood, weight belt, and surface float. If all these items are rented from the Sonoma Coast Divers, the cost will be $68 for one day. Divers are also required to have a valid CA. fishing license ($47.85 resident/ $14.30 one-day). These are purchased at a sporting goods or fishing tackle store. Parking and trespass fees will vary, but are the responsibility of the diver. They typically range from $6.00 to $8.00 for the day. Spearfishing can be challenging. We will be finding areas appropriate for the level of the group, but all participants must be in good health and in moderate shape and have the ability to swim. Tuition for the class is $125.00 A minimum of four divers is required to hold the class. Classes have the possibility of being postponed due to poor dive conditions. Classes normally meet at 9AM. 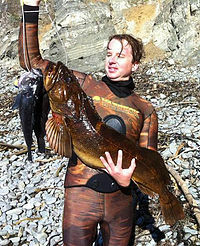 Call Sonoma Coast Divers to find out more about upcoming classes!